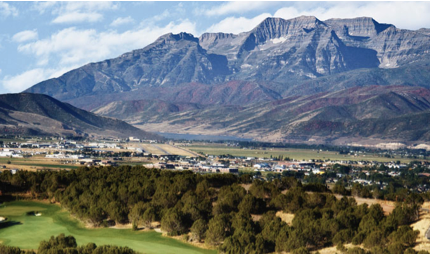 Take a chance to experience this breathtaking community with an exclusive package offered by Red Ledges. Appropriately named, the “Discovery Package” includes two nights and three days in a luxurious mountain cottage. The package also includes Golf for two on the Jack Nicklaus Signature Golf Course, dinner for two at Juniper Grill, and member privileges to multiple club amenities. Rate is $595. Characterized by the red rock and sweeping landscapes, Red Ledges has views worth more than any piece of real estate. In the heart of the Rocky Mountains, and near Mount Timpanogos, this outdoor experience is one that cannot be replicated elsewhere. Carefully designed neighborhoods make this private mountain community one of the best-kept secrets that Utah has. The beautiful landscapes mixed with the elegant real estate make this a Western American gem in all four seasons and give residents and visitors something to enjoy on any day of the year. Red Ledges offers amazing adventures awaiting those who visit. Boasting countless awards like “Best of State” is the 18-hole Jack Nicklaus Signature Course where a round of golf includes striking views of the Rocky Mountains. Owners can also enjoy the Jim McLean Golf School, one of the best golf schools in the country. Cliff Drysdale Tennis School, Equestrian Center, Swim & Fitness Club, and the Deer Valley private ski lounge also come as amazing amenities to Red Ledge’s homeowners. With 1,200 home sites, ranging from half an acre to over an acre, homesites start at $195,000 and luxury homes range from $650,000 to over $2 million.